A couple of weeks ago my husband and I adopted a rescue dog (hence why I have been a little quiet on here). 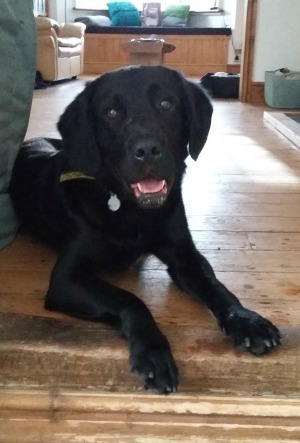 Milo is a three year old Lab cross, who came microchipped, vaccinated, neutered and with one month’s free pet insurance. Now unlike car insurance you are not legally obliged to have pet insurance, but it is a good idea as you never know what might happen in the future and vet bills can be expensive. I hate dealing with insurance. I have car and home insurance and neither of them feel like they are doing the best they can for me - just look at all that small print. So I was not really relishing the idea of organising pet insurance for Milo. After all this was a field I have no knowledge in. What is a good deal? What should I be looking for? After chatting with friends it seemed I should be looking for life cover, which means if Milo develops something which will affect him for the rest of his life the insurance will pay for the treatment for the rest of his life. Fair enough. The company who offer the free insurance to get you started, emailed me details of his insurance in the first week and suggested I might like to take up a full year with them. But although they must have all mine and Milo’s details to have set up the first month of insurance they did not seem to be able to send me an actual quote of how much a full year would cost. This always sets alarm bells ringing for me - if they will not tell me the price I probably cannot afford it. Then with a full two weeks to go before the cover expired I received another email titled ‘Milo's 4 weeks' free pet insurance is about to expire’. Really? I thought I still had two weeks. Finally they rang me today, and this time I actually got some prices from them, but not before I had had to give all my personal details (which they should have already had and some I am sure they do not need) and listen to him read the whole script out - no room for questions there. All in all it has been a very poor customer experience. I would have preferred an email with all the costs right at the beginning rather than a phone call which was probably supposed to feel personal but felt anything but. And I really disliked how the chap gave me a cost then suggested he could give me a discount if I found something better. Why not just give me the best price right now? I do not think they will be getting our business. So take aways. Remember that User Experience is more than just the website or app, it is part of a much bigger thing called Service Design. See how just a few things can really turn a customer off. If you are offering a product, it does not matter what it is just tell me how much it will cost. I should not have to ring you to get a quote. And if I do have to ring you, or you ring me, make sure your staff can deal with leaving the script. Knowing the person on the other end of the phone is just reading a script at me makes the whole thing feel really impersonal. I do not feel like a valued customer, part of a conversation, just someone to convince to part with their cash. And if you are sending emails make sure the titles are correct and relevant. It might be relevant if I had a years insurance with them, but this was only a free four weeks, and it made me open the email to check when the insurance runs out, but my trust of the company went down at the same time. In the competitive world we now live in, where a comparison site can give me 50 other insurance companies to look at with a couple of clicks, the user and customer experience is the thing that will really make your company stand out to me.